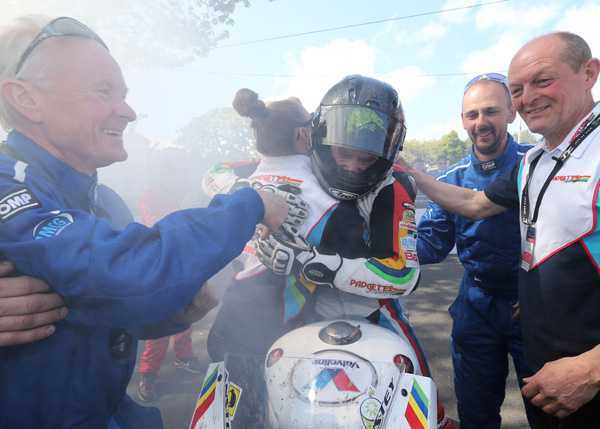 Bruce Anstey got the 2015 Isle of Man TT Races, fuelled by Monster Energy, up and running in superb style on Sunday afternoon when he swept to a hugely popular victory in the RST Superbike race. 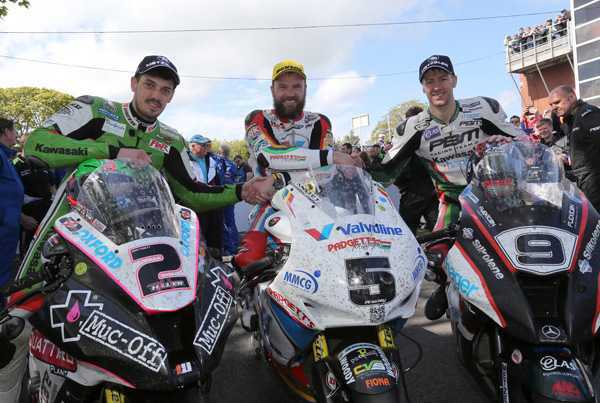 The Kiwi overhauled early race leader Ian Hutchinson at the beginning of the fifth lap and took his 10th TT win - and first in the Superbike class - by 10.9s with James Hillier taking third after Michael Dunlop crashed out on the final lap. After a three-minute delay, the race got underway at 2.03pm and Hutchinson who led at Glen Helen by just 0.2s from Anstey with Hillier in third just half a second further back. However, one of the pre-race favourites Guy Martin was already out having stopped at Ballagarey. By Ramsey though, Hillier had taken over at the front with his advantage over Anstey half a second with Hutchinson back in third but only a further half a second adrift. However, an opening lap of 130.959mph gave Hutchinson the lead after the run over the Mountain with his lead over Anstey 1.2s as Hillier slotted into third. Dunlop moved up to fourth with John McGuinness in fifth and Gary Johnson sixth. Second time round and Hutchinson eked out his lead at each of the commentary points and with a near identical lap, 130.901mph, the gap over Anstey was up to 4.4s as the riders came in for their first pit stop. Hillier maintained station in third, four seconds down on Anstey, and he'd also caught McGuinness on the road, the 21-times winner still in fifth behind Dunlop. Johnson was holding onto sixth from Conor Cummins and William Dunlop. The gap between the leaders remained practically the same all the way round lap three, Hutchinson's lead now 4.79s. Dunlop was up to third, thirteen seconds in arrears with Hillier only two seconds behind. McGuinness was now joined by Honda team-mate Cummins in the top six. Anstey was getting firmly into his stride now and all the way round the fourth lap, he reeled Hutchinson in and with a lap of 131.333mph, he was just 0.2s behind coming into the second pit stop and his Valvoline Racing by Padgetts team turned the deficit into an advantage and he was two and a half seconds clear at Glen Helen. The 45-year old was now circulating on the roads in close company with McGuinness, Hillier and Dunlop and he pulled a few tenths out at each commentary point. Anstey was getting more and more secure at the front and all eyes fell on Dunlop who was putting in a final lap charge. 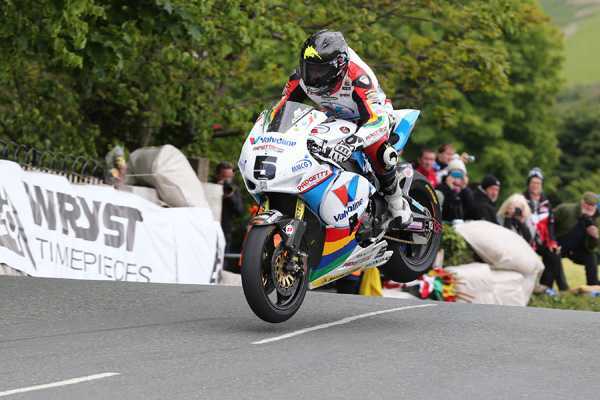 Anstey's lead was up to 5.5s at Ballaugh on the final lap and with a final, flying lap of 131.797mph, he crossed the line a more comfortable 10.9s clear of Hutchinson who was back on a TT podium for the first time since 2010. However, Dunlop's final lap charge ended at the Nook when he crashed out after tangling with a slower rider and so Hillier took third, his first Superbike TT podium. McGuinness, William Dunlop and Michael Rutter completed the top six but the incident at the Nook brought the red flag out and no other riders completed the full race distance. Following the Dunlop incident, which resulted in the red flag, seventh place onwards was taken from the end of the fifth lap and so Dan Kneen, Peter Hickman, Lee Johnston and David Johnson completed the top ten. Gary Johnson also crashed out on the last lap at Guthries but was reported as OK and will be fit for tomorrow's races. Andy Lawson was taken by airmed to Nobles with neck and arm injuries after an accident at Guthries while Scott Wilson, who was the other rider involved in the accident at the Nook was also taken by airmed to Nobles and was reported to have a broken clavicle.